I have loved bringing in natural elements this season to prepare for spring and get me excited to decorate. One of the colors I've been bringing in is green. It's so fresh and bright while still being neutral. I've put together an Inspiration Sheet with all things green. Greenery is the 2017 Pantone Color of the Year so what better time to bring in some green elements? You all know I'm a very neutral decorator, but I've had so much fun bringing in pops of color to brighten up my home this year. Any of these items on my Inspiration Sheet are ones I would purchase to fill my home with this beautiful color. All of these are great ways to add that pop of color. Throw pillows and natural elements are my favorite ways to switch it up. 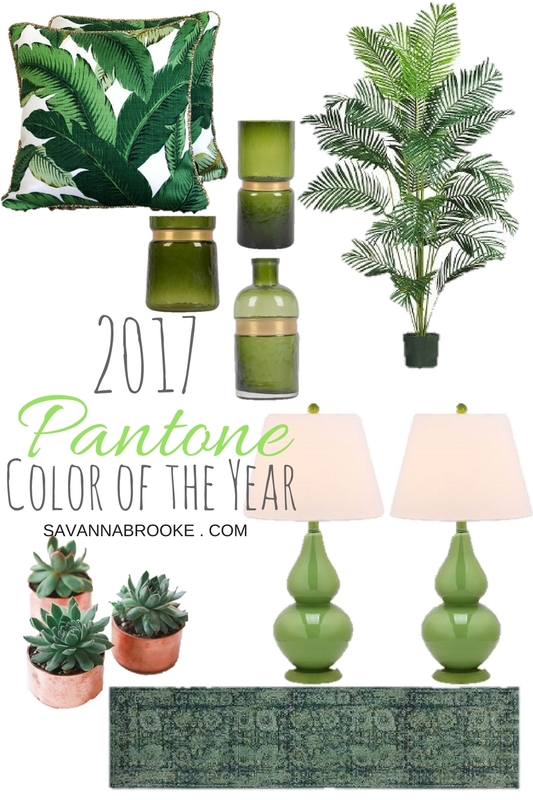 I was inspired by Douglas Elliman Real Estate Florida's website to talk about the Pantone Color of the Year and how I would use it in my home. I've learned that when used right, color in your home is actually a beautiful thing. I've always loved color but I never knew how to bring it into my home in the right way so I avoided it completely. Cohesive pops of color and greenery are a great way to start when bringing in color. Funny thing: one of the first colored pieces I brought into our home was one of those green vases in my Inspiration Sheet above from Target (direct source link below). They work all year round. The gold warms them up a bit so they can be used in fall or spring. I love it so much. Next is a little vignette I styled to show how I've brought some of the 2017 Pantone Color of the Year into my own home for spring. This space is my very tiny/ non-existent entry way in our home. I added some greenery for a cheerful scene when you walk in our home with a plant I already had (and somehow have kept alive) along with some faux succulents from the Target Dollar Spot. That plant mister is from Target as well and everything else was thrifted. Lucky for Florida, they get to experience this beautiful color outside all year round. For me in Missouri, it only comes around for a little while so I like to soak it up as long as I have it. I just love this color and how it is still neutral. I love plants not only for their beauty but they also cleanse the air. That's why I try to have plants around all the time but I have a black thumb so it's not always happenin around here. I try to find plants that are pretty much fool proof like succulents (although I have killed my fair share). Nothing's safe with me! If you want some more inspiration for your home this spring, don't hesitate to head over to Douglas Elliman's Florida website HERE. So full of inspiration for the seasons to come. What have you done to incorporate the 2017 Color of the Year? I'm loving this years color. So cheerful yet neutral. I hope you all have a beautiful week! Thank you again for stopping by to see what I'm up to. I truly appreciate it!! A detailed source list for my Inspiration Sheet is below.